It’s been over a week since that story broke but I just noticed the signs this morning. The letters to the editor section of Wed’s paper has letters from Jeff Quinnell, Kim Ernst, Elaine Thurston and Bill Soderlund that are critical of the paper’s treatment of Lansing, and one from Adam Tomczik that’s supportive. I’ve not yet made up my mind on the News’ coverage of Lansing. Suzanne Rook’s articles have seemed to be very thorough investigative pieces, requiring a deep understanding of complex financial matters. I can’t remember the last time the paper’s done such a signficant investigative series. I don’t yet know how she obtained the Council packet but assuming it was a City Hall leak and that the paper didn’t pay anyone for the info, I’m impressed with what the paper has done. 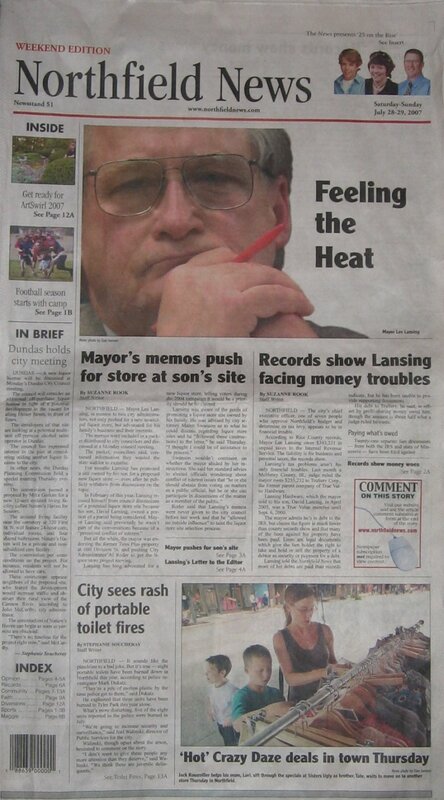 I’m undecided about the paper’s coverage of Lansing’s personal/business financial trouble. It’s an important factor in the story because it establishes the likely motivation for his actions. But I have some uneasiness about the degree of emphasis and level of detail. I can’t quite put my finger on it. Likewise, their ad campaign. It seems like rubbing it in, but then, it WAS a breaking news story and it’s unusual for them to use their web site in this way. More letters to the editor in the Nfld News today about their reporting on Lee Lansing: critical, from Susan Crow and James H. Johnson; supportive from Terry Schmidt. 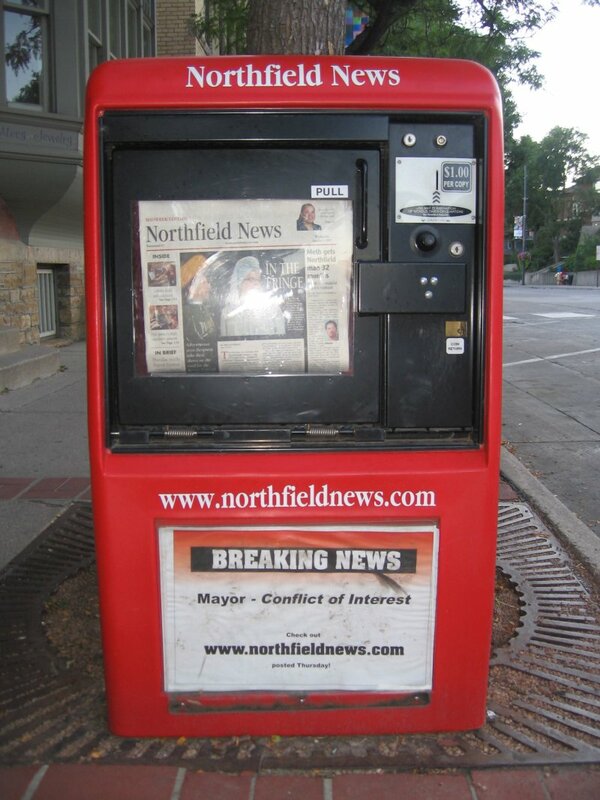 Regardless of what the final outcome may be, I find it extremely questionable for the NFNews to use the personal financial troubles of one of the leading citizens/family of this community as an advertising campaign. This is a crass , and possibly biased, use of a personal situation to the detriment of not just an individual, but to the whole community; a community which is, at this difficult point in time, trying to figure out how to move through the next months in a productive way. I would fully welcome a more investigative local newspaper environment here; but the choice to do it on this personal level, before all the facts are known, would appear to be exploitive rather than investigative. Where was the News on the issue of the licquor store site discussion when there were curious dynamics, closed sessions, obvious questions not asked by city council, and related issues which might well have stimulated some investigative journalism? I’m sure most of the public does not care to know all of a downtown businessman’s personal plight……. but does care to know how the processes at City Hall have seemingly gone so wrong.